Programmers have to consider cardinality in data. For instance, a simple mailing list program may need to deal with people having multiple addresses, or multiple people at the same address. Likewise, we may have a number of alternative implementations of an algorithm. Perhaps the system can send an email, or fax a pdf, or send paper mail, or SMS, or MMS, or post a Facebook message. It's all the same business, just different delivery means. Analyst: "Customers rarely use that feature, so it shouldn't be hard to code." Program features are rather existential--they either have to be written or they don't. "Simplicity" is largely a matter of how few decisions the code has to make, and not how often it is executed. We have no unneeded or superfluous constructs in our system. Building to immediate, current needs keeps our options open for future work. If we need some bit of code later, we can build it later with better tests and more immediate value. Likewise, if we no longer need a component or method, we should delete it now. Don't worry, you can retrieve anything you delete from version control or even rewrite it (often faster and better than before). If we only need one right now, we code as if one is all there will ever be. We've learned (the hard way!) that code needs to be unique. That part of the rule is obvious, but sometimes we don't apply "so far" to the rule. Thinking that you might need more than one in a week, tomorrow, or even in an hour isn't enough reason to complicate the solution. If we have a single method of payment today, but we might have many in the future, we still want to treat the system as if there were only going to be one. Future-proofing done now (see the "options" card) gets in the way of simply making the code work. The primary goal is to have working code immediately. When we had originally written code with multiple classes and we later eliminate all but one, we can often simplify the code by removing the scaffolding that made "many" possible. This leaves us with No Superfluous Parts, which makes code simple again. Code is simpler when we write it to a general case, not as a large collection of special cases. A list or array may be a better choice than a pile of individual variables--provided the items are treated uniformly. Consider "point0, point1, point2." Exactly three variables, hard-coded into a series of names with number sequences. If they had different meanings, they would likely have been given different names (for instance, X, Y, and Z). What is the clear advantage of saying 'point0' instead of point? 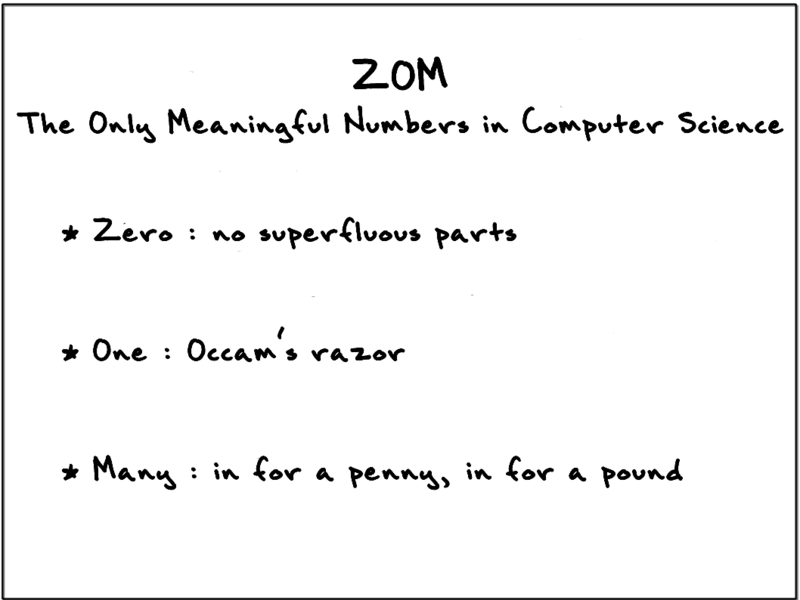 It's usually easier to code for "many" than a fixed non-zero number. For example, a business rule requiring there are exactly three items is easily managed by checking the length of the array, and not so easily managed by coding three discrete conditionals. Iterating over an initialized collection also eliminates the need to do null checking when it contains no elements. Non-zero numbers greater than one tend to be policy decisions, and likely to change over time. When several possible algorithms exist to calculate a result we might be tempted to use a type flag and a case statement, but if we find a way to treat implementations uniformly we can code for "many" instead of "five." This helps us recognize and implement useful abstractions, perhaps letting us replace case statements with polymorphism. Naturally, these aren't the only simple rules you will ever need. But simple, evolutionary design is well supported by the ZOM rules regardless of programming language, development methodology, or domain.